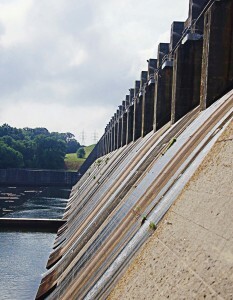 Since construction began on it in March 1947, the John H. Kerr Dam and Reservoir has given Boydton, Va., and neighboring states recreational activities such as fishing, boating and swimming. More importantly, it has provided hydroelectric power and flood control. Operated by the U.S. Army Corps of Engineers Wilmington District, the facility is a valuable source of hydroelectric power. One of 22 such projects, power from the Kerr-Philpott System is marketed to local and regional customers throughout Virginia and North Carolina, according to Daniel Brown, Wilmington District chief of operations support branch of the ACE. “The Southeastern Power Administration oversees the sale of federal power produced at John H. Kerr Reservoir; however, it is sold to public bodies and cooperatives, not private entities,” said Brown. Almost 500 preference customers in the states of Georgia, Florida, Alabama, Mississippi, southern Illinois, Virginia, Tennessee, Kentucky, North Carolina and South Carolina reap the energy generated at the site. The Kerr dam generates an average of 426,749,000 kilowatt hours per year while preventing flooding damages estimated at more than $385 million. The majority, 58 percent, goes to the Virginia Electric Power Company. The remaining 42 percent goes to the Carolina Power and Light Company. The amount of hydropower created yearly by the John H. Kerr Dam speaks to the success of this renewable and clean method of power production. Dams such as Kerr, which was named after a congressman from North Carolina who helped bring it into being, were planned with a purpose. According to Brown, sepa was created in 1950 by the secretary of the interior to carry out the functions assigned to the secretary by the Flood Control Act of 1944. In 1977 it came under the control of the newly formed United States Department of Energy. While hydroelectric plants cost a considerable amount on the front end, the sale of electricity pays back all the costs of building, operating and maintaining hydroelectric facilities, and covers most of the costs of the reservoirs that provide flood control, navigation and recreation, according to sepa. In addition to paying for the initial start up of the hydroelectric facilities, sepa also covers most of the costs of the reservoirs that provide flood control, navigation and recreation at each of the lakes. The site of the dam was chosen for its firm foundation of granite — needed to bear the crushing load of cement. The lake that formed behind it was originally called Buggs Island Lake after a nearby island named for 18th century pioneer Samuel Bugg. In 1951 the name of the project was changed. Fifty-three monoliths comprise the sections of the dam complex. It consists of not just the dam, but a powerhouse and switchyard as well. The gravity-type dam has all of the generated electric power conducted onto a common high voltage bus with six transmission lines that feed into the power companies. The dam operates at 83 percent efficiency and produces 227 megawatts via seven vertical Francis units, a kind of water turbine. The plant has six generators, that produce 32 megawatts, with an additional smaller one producing another 12 megawatts. The nearly 1.6 million visitors that journey to the dam and reservoir every year impact the town of Boydton’s economy. The hydropower created by the Kerr dam supplies not only part of Virginia but also the Carolinas, and speaks to the success of this renewable and clean method of power production. The reservoir’s land spans not only a length of Virginia but also a stretch of North Carolina and provides opportunities for recreational and educational activities. The ACE oversees campgrounds in both the North Carolina and Virginia State Parks. Wildlife preservation, swimming and boating remain favorite activities. Large-mouth and striped bass fishing are also big draws to the area. SEPA is well aware of the pluses and minuses of hydropower production. Hydropower can help meet peak load requirements and provide the power reserve cushion that consumer-owned electric utilities must have to operate; however, it’s not always available, particularly when lake levels are low. During those occasional drought conditions when the water levels drop at any of the dams sepa oversees, facility consumers or special interest groups sometimes pressure the ACE to make recreational activities a priority by not allowing as much water through the dam. The agency urges consumers to remember why the dam was built in the first place.